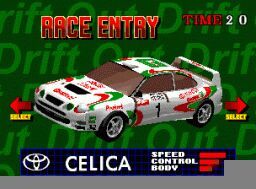 The very first thing you need to know: At the beginning of the game, you should use the first car, the celica, that shows up, the one with maximum top speed. You almost always keep that finger on the accelerator except on curves over 45 degrees. I've never seen a purpose to ever use the brakes in this game. Avoid all water puddles if possible - you will lose time because you'll lose speed. Move smoothly into the curves. In other words, don't hold an arrow button for the length of the curve, use it in small spurts unless you need to save yourself. Practice Stage (60 sec, 09.98, BBH): Nothing very interesting, it's a dirt track, so the slippiness level is harder than the first stage, so go into curves early. 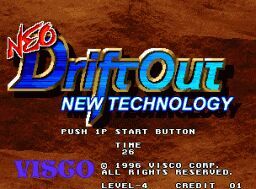 Stage 1 (60 sec, 42.12, DDR): Road course, the easiest course in the game. Take both shortcuts here. The 90 degree turns are actually easier because of it's sharp nature. The game helps you quite a bit on those turns. Stage 2 (68 sec, 56.22, JSW): Dirt course, so slippier than course one. You only take the first shortcut. 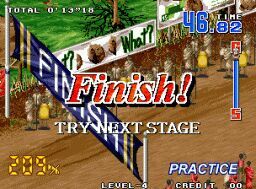 Here's a bit of an issue though - animals like to dominate the screen before the turn of the shortcut, making the game slowdown, so timing in this curve is difficult to achieve - it will take several tries to get it right. On the non-shortcut you will take, there's S-Curves. Don't treat it like this - the straighter the car you can get, the faster your time. Near the end there's a place where you can cut through the curve. Ya better do that - that also saves time! The music can help you time this one - if you hear the higher portion of the music while on the straight before the S-Curves, you did well on the first part of the course. Stage 3 (78 sec, 60.97, UFox): Road course, but has slippier snow if you decide to go off the road. Take all shortcuts. There's an S-Curve on one of these where you can take serious shortcuts. Take shortcuts through the snow at any opportunity, it will save more time than the road. There is a curve with ice on it - so it's obviously slippery. Try to take as much of an inside line as possible. 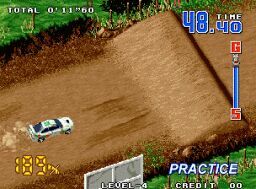 Stage 4 (87 sec, 76.50, Gameboy9): Dirt course. Don't take the second shortcut. It's a little bit faster than the shortcut. There is an S-Curve near the end - keeping the car as straight as possible really helps here. It will be very hard to finish without hearing time beeps. Stage 5 (86 sec, 71.55, DDR): Snow course, VERY slippery! Believe it or not, take the first shortcut, don't take the second, and take the third. In the first shortcut, when he finishes his hill announcement, hit the brakes and hard. Turn left while in the air. When it's said and done, you've saved about two or three seconds if you did it right. You still might save some time even if you screw up. There's some curves with ice in them. The same strategy applies as stage three, especially in the third shortcut where you'll find S-Curves. Then you need to apply stages 2(keeping as straight a line as possible) and 3 strategies. Before the third shortcut, there's a mini-shortcut. It will come really quick when announced, consider an ice patch on the top of the track on that straightaway as your warning. 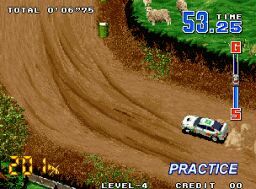 Stage 6 (95 sec, 86.33, Gameboy9): The ultimate test on a dirt course. Take the lone shortcut here. There's an unannounced S-Curve on the straightaway where you should avoid all water puddles - they will take time away from you. There is an announced S-Curve about 20 % in the race where the straight as possible technique comes back into play. During the shortcut you'll see the track temporarily split into two. Either path is just as good to my observation, but I like the right path, the one with no obstacles, better. You'll probably run out of time on your first attempt, shoot, I've yet to finish without hearing time beeps, I don't think anybody has to my knowledge.